Jesus - there is no other Name under heaven given to mankind by which we must be saved. So why do I call Him Yeshua? Simply put, it's His God-given name! God sent the angel Gabriel to the Virgin Mary, a young Hebrew speaking Jewish girl, with a message. The message was that she would conceive, give birth to a Son, and name Him Yeshua. Remember, Mary spoke Hebrew, not English. Yeshua is the original Hebrew name of Jesus of Nazareth. My native language is English, not Hebrew. So why do I call Him Yeshua? For me, it's a personal choice. When Jesus walked this earth, all his closest friends and family members knew Him as Yeshua. For me, there's something very personal and intimate about the Name Yeshua. But is it necessary for other Believers to call Him Yeshua? No, not at all! Yeshua (Jesus) is well aware that we speak different languages. Here is the Name above all names in several languages. In Hebrew, names have meanings. 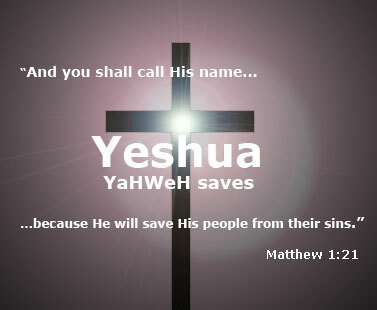 The Hebrew name Yeshua means "salvation", or "Yahweh will save." However, the English name Jesus has no intrinsic meaning. The name Yeshua translated into Greek is Iesous. The Greek name Iesous when transliterated into Latin becomes Jesu. When the Latin name Jesu is further transliterated into English, it becomes the name Jesus. A translation conveys the same meaning. So, the Hebrew name Yeshua and the Greek name Iesous have the same meaning. On the other hand, a transliteration is simply an exchanging of letters of one language for letters of another language that make the same sounds. Consequently, meaning is lost in transliteration.